The New York Jets destroyed the Detroit Lions in the first of two Monday Night Football games, while the Oakland Raiders and Los Angeles Rams fought a close game in the first half, but one that the Raiders pulled away with in the second, winning, 33-13. Sam Darnold threw a pick-six on the very first regular season pass of his career, but he rebounded nicely after it, throwing a couple more touchdowns while being assisted by his defense and special teams units en route to a 48-17 win. Darnold completed 16 of 21 passes for 198 yards, a pair of touchdowns and the interception. Matthew Stafford, who was clearly injured on two separate plays and was briefly replaced by Matt Cassel, threw four interceptions in the losing effort. He also got basically nothing from his running game, which totaled just 39 yards rushing, while the Jets ran for 169 yards as a team. In the second game, the Raiders came out with a strong offensive gameplan, attacking the Rams’ soft zone. They found some success doing that, but the Rams made some serious adjustments at halftime, and the Raiders fell apart. Derek Carr wound up throwing three interceptions, one of which was probably the worst of his career. The Los Angeles defense helped out the offense, which got an uneven game from Jared Goff. He threw for a couple touchdowns, but he missed a ton of throws despite strong protection from his offensive line. Still, he did enough, along with Todd Gurley (108 yards rushing) and the defense to get the win. Below, you can see the entire evening’s live blog in reverse order. Rams 33, Raiders 13, FINAL: Raiders get the ball back, but they’re just running the ball here. They pick up a first down, and call a timeout with 13 seconds remaining for some reason. They run it and the game is done. Rams 33, Raiders 13, 1:59, 4Q: And if this one wasn’t over before, it is now. The Raiders pick up a quick first down, and then Carr is picked off for the third time, this time by Peters, who takes it in for a touchdown. Rams 26, Raiders 13, 3:15, 4Q: Rams get the ball back with a chance to ice this game. They come out throwing, and Goff hits Kupp for 10 yards on a third down. Gilchrist blows up a Gurley run in the backfield for a 7-yard loss. They recover from it after Brown catches a 9-yard pass. Then Gurley picks up another 10 yards on the ground, and they’re in the red zone. They run the ball a couple times, and Zuerlein kicks a 20-yard field goal. Stick a fork in ‘em. Rams 23, Raiders 13, 7:58, 4Q: Raiders get another huge reception from Cook, but right afterward, Carr throws perhaps the worst interception of his career. The defender had all day to pick this one off. Whew. Rams 23, Raiders 13, 9:19 4Q: Raiders get a touchback followed by an incomplete pass, but a Los Angeles penalty for illegal use of hands give them five yards. They can’t get a first down though, and have to punt. Rams called for holding on the return again, but they have a chance to increase their lead here. Goff goes to Gurley off the play action for 3 yards, and then does it again, getting 17 yards this time. A short pass and an incomplete pass gives the Rams a 3rd-and-short near midfield. Gurley gets the ball and picks up the first down. Goff goes deep to Woods for a touchdown but it’s JUST out of Woods’ reach. A couple plays later, Whitehead bats down the third down pass and stalls the Los Angeles offense. Rams attempt a 55-yard field goal, and he puts it through. Rams 20, Raiders 13, END 3Q: The Raiders go three-and-out, and the Rams are called for offensive holding. So they get the ball on their own 42-yard line. They get a quick first down with a 17-yard reception for Cooks. Then another one to Cooks that goes for 30 yards. From the red zone, Goff finds Kupp for an 8-yard touchdown, and the Rams are back on top. Raiders 13, Rams 13, 3:53, 3Q: Lynch picks up a quick first down for the Raiders, who then face a 3rd-and-10 after a couple of incomplete passes from Carr, one of which was nearly intercepted. Carr is under heavy pressure on third down, and he’s forced to throw it away. They will punt. The Rams get the ball back, but it’s a very short drive and they punt as well. Exciting! Raiders 13, Rams 13, 9:07, 3Q: Back from halftime, the Rams take over on their own 30-yard line. Gurley immediately picks up 15 yards on the ground for a first down. Goff finds Cooks for a 23-yard gain and a new set of downs. Then he finds Kupp on third down and is into the red zone. After two unsuccessful runs, Goff tries to go to Kupp on third down, and it’s nearly intercepted — the second dropped pick by the Raiders in this game. Zuerlein ties it up with a field goal. Raiders 13, Rams 10, END 2Q: The Raiders ran a very effective two-minute drill, helped by another big Cook reception but hurt by a could penalties. Nugent missed the field goal attempt, but the Rams were called for offsides. Nugent is good on his second attempt from 48 yards out, and the Raiders have the lead back. The Rams kneel out the remaining 10 seconds of the half. Raiders 10, Rams 10, 2:40, 2Q: The Rams pick up a quick first down thanks to Woods and KUpp. Gurley picks up 4 yards on a 1st-and-goal. Goff has a pass nearly intercepted, but it’s dropped. So 3rd-and-goal, and Goff has good blocking — but he can’t find his man, leading to a fourth down and another field goal attempt for Zuerlein. This one is good, from 20 yards. Raiders 10, Rams 7, 4:51, 2Q: The Raiders just saw a glowing opportunity to make it a two-score game, with a 2nd-and-10 from the LA 21, but Carr’s pass intended for Cook was intercepted by Johnson for a touchback, giving the Rams the ball back. There was a Nelson 17-yard reception and a Martin 13-yard run on the drive. Raiders 10, Rams 7, 9:26, 2Q: On the Rams’ next drive, they’re into Oakland territory. On a 3rd-and-8 from the Oakland 20-yard line, Goff is sacked and fumbles, though the Rams recover. Unfortunately for them, Zuerlein can’t convert the 46-yard field goal, and the Raiders maintain their lead. Raiders 10, Rams 7, 12:31, 2Q: The Raiders quickly move into the red zone with a 28-yard reception by Cook. Lynch loses five yards, but on second down, Carr scrambles for 6 yards. 3rd-and-goal from the LA 9-yard line, and the pass to Nelson only picks up 3 yards. With a new long snapper, the Raiders get the lead back when Nugent kicks a field goal from 24 yards out. Raiders 7, Rams 7, END 1Q: Raiders eat a holding penalty on their first play. Carr makes up for the difference with a 12-yard pass to Derek Carrier, but it’s still a 2nd-and-8. They then have a false start, but are assisted by a roughing the passer penalty on Donald, giving the Raiders a new set of downs. They convert a 3rd-and-7 with an 11-yard pass to Cook. They convert another third down and move into Los Angeles territory as the first quarter comes to an end. Raiders 7, Rams 7, 4:53, 1Q: The Rams defense is assisted by a false start penalty, and they hold quickly, forcing a Raiders punt. Goff throws incomplete to Kupp, then finds him for 10 yards and a first down. Then Goff finds Woods for 21 yards, and Gurley runs in a 19-yard touchdown to tie the game up. Here we go! Raiders 7, Rams 0, 08:43, 1Q: The Rams started their offensive showing off with a quick 3-and-out. Hekker punts, and Harris takes it to the Oakland 15. Raiders 7, Rams 0, 10:23, 1Q: Derek Carr hit Jared Cook for a 45-yard reception after a quick first down off of Marshawn Lynch runs. Cooper goes for a 9-yard run, and then Lynch runs it right up the middle for a 10-yard touchdown and a 7-0 Raiders lead to start it off! Jets 48, Lions 17, FINAL: New York has the ball back, and they fail to convert the third down again, but this time, they go for it on 4th-and-short, with Darnold completing a pass to Cannon for 6 yards and another first down. They went for it again on another 4th down, and got it. From there, Darnold took a knee to end the game. And now we move on to Rams vs. Raiders! Jets 48, Lions 17, 6:49, 4Q: Stafford is on the bench, and Cassel is out there. They get a quick first down, but come up short on a 3rd-and-1 when he couldn’t find Golladay. On fourth down, Adams picks off Cassel after the ball was deflected! Jets 48, Lions 17, 8:15 4Q: The Lions get the ball back, down a million points or so, and they begin driving. They move into the red zone with a couple first downs, but on 3rd-and-5, Stafford overthrows Jones by a mile. They leave the offense on the field, and Stafford can’t hit his man over the middle. Turnover on downs. The Jets eat some time off the clock, but can’t pick up a first down. They punt, the Lions take over on their own 45-yard-line. Jets 48, Lions 17, 0:54, 3Q: The Jets are scoring points faster than I can blog them! On the second play of their next drive, Crowell ran in for a 62-yard touchdown, and the extra point was good! Jets 41, Lions 17, 1:46, 3Q: A quick Jets drive yields no first downs, but it does yield a 32-yard field goal from Myers. The LIons then took over in Jets territory, but couldn’t pick up a first down. And Prater couldn’t nail the 44-yard field goal attempt, so there goes that. Jets 38, Lions 17, 6:47, 3Q: Stafford is back in the game. His first pass goes incomplete, and his second … is picked off by Lee, again. Sheeesh! This one is getting out of hand. Jets 38, Lions 17, 7:00, 3Q: Things are getting even worse for the Lions: Stafford went down with an injury and had to exit the game. Matt Cassel came in, threw an incomplete pass and then … Roberts returned Martin’s punt 78 yards for a touchdown. 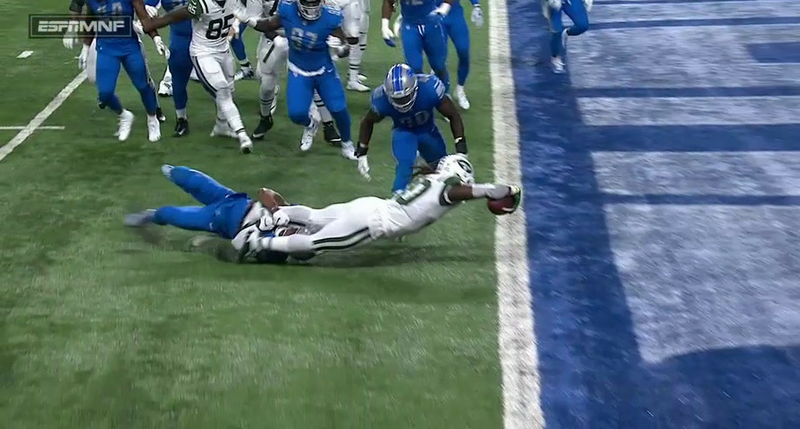 Jets 31, Lions 17, 8:07, 3Q: Wow! Stafford throws another interception! It’s a short, almost sidearm throw and it’s picked off by Lee, who takes it 36 yards for a touchdown. Jets build on their lead. Jets 24, Lions 17, 9:36 3Q: It doesn’t take long for the Jets to respond. They took over on the Detroit 48-yard line, and Darnold quickly found Pryor for a 20-yard reception, and then Enunwa for a 21-yard touchdown. Extra point is good and the Jets lead again. Jets 17, Lions 17, 13:10 3Q: Stafford finds Tate for a 26-yard reception down the left sideline following a false start penalty. Then he finds Golladay for a 26-yard reception. And now it’s a tie game, as Stafford finds Tate for a 24-yard touchdown! Jets 17, Lions 10, END 2Q: Stafford finds Golladay for 10 yards, then 11 yards. Defensive offside gives them 5 yards, and they’re into Jets territory. Buster Skrine is injured on the next play, a Stafford pass to Tate for 11 yards. Nickerson is called for taunting after replacing Skrine, giving the Lions a 1st-and-goal. The first play is an incomplete pass. The second is a short run to the 3-yard line. The third is almost intercepted. It probably should be reviewed, but it isn’t, and Prater kicks a 21-yard field goal. Jets 17, Lions 7, 2:00 2Q: The Jets get a false start, and then on a 3rd-and-2, Darnold hit Anderson for a huge 41-yard touchdown pass, giving them a two-score lead over the Lions! Jets 10, Lions 7, 3:26, 2Q: Jets get the ball back and Darnold completes some nice passes, but they ultimately lose 9 yards on a 3rd-and-1, putting them out of field goal range. They punt it, giving the Lions the ball at their own 6-yard line. Stafford completes a pass to Jones for 11 yards, but he came up limping after taking a hit on the play. He stays in the game, but can’t pick up another first down, forcing a punt. Jets 10, Lions 7, 9:24, 2Q: The Stafford and the Lions offense pick up a couple first downs, including a Golladay 25-yard reception. On a first-down play, Stafford threw a pick to Trumaine Johnson, who was then hit hard by Golladay, who then recovered the fumble he just forced. So the Lions retain possession! The medical staff also appear to have taken Johnson to the locker room to check for a head injury. Slay, by the way, has been cleared to return for Detroit. On a 4th-and-14, Prater attempted a 56-yard field goal, but it’s no good. Jets keep the lead. Jets 10, Lions 7, 14:57 2Q: Myers is good from 35 yards out, so the Jets have their first lead of the season! Jets 7, Lions 7, END 1Q: Darnold picks up a first down on his feet with a 6-yard run, and Powell adds another one with a 14-yard run immediately after. But on the next second down, Darnold ate a 10-yard sack when he really should have thrown the ball away. So the Jets had a 3rd-and-20, and Crowell took it 14 yards, setting up a much shorter field goal attempt from the 17-yard-line. Jets 7, Lions 7, 4:20, 1Q: Bad news for the Lions, as cornerback Darius Slay was injured on a play and immediately went to the locker room. We’ll have more on that if and when there’s more information. And shortly after, we have a “what is a catch?” moment. Darnold completed to Enunwa for 8 yards, Detroit challenged and the ruling was upheld. Crowell then ran up the middle for a diving 6-yard touchdown! Tie game. Lions 7, Jets 0, 6:54, 1Q: It’s an incomplete pass to start for Stafford, but a defensive pass interference penalty gives them 12 yards and a first down. They then lost 7 yards on a running play, and couldn’t make up the yards, punting it away. It was fielded by Roberts and he gets a good return out of it! 43 yards, to be exact. The Jets will take over on the Lions’ 32-yard line! Lions 7, Jets 0, 8:36, 1Q: After the pick six, Powell picks up a quick first down, and then Darnold converts a 3rd-and-6 for a third set of downs. Crowell picked up the next first on a third-down run of 3 yards. After another couple plays, facing a 3rd-and-5, Darnold eats an 8-yard sack from Ansah, so the Jets will punt it away. The Lions will take over on their own 10-yard line. Lions 7, Jets 0, 15:00, 1Q: Well, that wasn’t great. Sam Darnold started the game with an interception, which was returned for a touchdown. Welp. 7:10 p.m.: The Jets and Lions will kick off shortly, and then we’ll get our live blog cookin’! The first week of the 2018-19 NFL regular season will end with a Monday Night Football doubleheader, featuring a matchup between the New York Jets and Detroit Lions at 7:10 p.m. ET and then the Los Angeles Rams against the Oakland Raiders at 10:20 p.m. ET on ESPN (live streaming via WatchESPN). Sam Darnold will be starting at quarterback for the Jets, who are hoping their young signal caller can make them competitive again. The Lions still have Matt Stafford at quarterback, but a new head coach in Matt Patricia. In the latter game, Jon Gruden makes his long-awaited return to head coaching as the Raiders play host to the Rams. Both teams have undergone some drastic changes, though most would say the Raiders have gotten much worse — especially by trading Khalil Mack to the Chicago Bears — while the Rams have picked up several talented new players through trades and free agency over the offseason. While the Raiders traded Mack, the Rams extended Aaron Donald, perhaps the only front seven player in the NFL who can claim to be better at what he does than Mack. Both players drew headlines throughout the offseason as they demanded new deals, but in the end, the Raiders lost a phenomenal player while the Rams spent the entire offseason grabbing pretty much every name they could, including Marcus Peters and Aqib Talib, the team’s new starting cornerbacks. We’re going to have a live blog of the action on Monday evening, so check back here when the games get underway. For now, below is all you need to know to watch the action. Odds: The Lions opened up as 6.5-point favorites for the matchup. Odds: The line opened at even odds, but after the Mack trade, the Rams became favored by 5.5 to 6 points on most books.